Small metal GRU plaque and button. Mounting: Screwed to wall using metal fixings. Finish: varnished, lettering carved in. Condition: Good, solid although the tail of the cross has been removed. 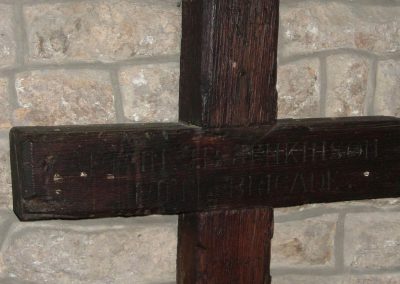 THIS CROSS MARKED THE GRAVE/ AT VENDRESSE FRANCE OF/ CAPTAIN JOHN BANKS JENKINSON/ KILLED IN ACTION AT THE BATTLE/ OF THE AISNE ON 14TH SEPT 1914/ IT WAS BROUGHT TO ENGLAND IN 1924/ BY HIS WIFE/ JOAN/ WHO ERECTED THE WINDOW ABOVE AND/ REQUESTED THAT THE CROSS BE PLACED HERE/ AFTER HER DEATH. SHE DIED 13TH DEC 1964/ AND THIS TABLET IS PUT HERE/ IN LOVING MEMORY OF THEIR PARENTS BY/ ANTHONY BANKS JENKINSON 13TH BARONET/ AND ELIZABETH JENKINSON DREYFUS/ WIDOW OF HENRY DREYFUS DSC. 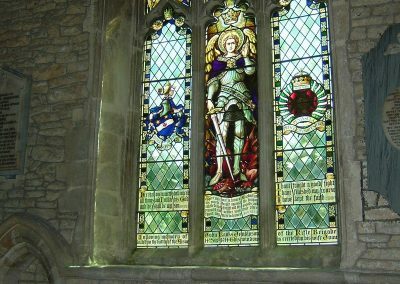 His grave marker resides in the church beneath a stained-glass memorial window which was installed in 1916. The marker along with a marble plaque were installed after the war. John Banks Jenkinson born on 9th June 1881 and was the great-great nephew of the Second Earl of Liverpool (Baron Hawkesbury), the 19th Century British Prime Minister. He was the eldest son and heir of Sir George Banks Jenkinson, Bt. 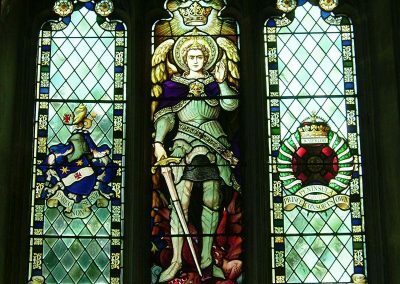 Educated at Harrow, he was a career soldier joining the Rifle Brigade in 1899 and having passed through the Royal Military College at Sandhurst was commissioned in March 1900. 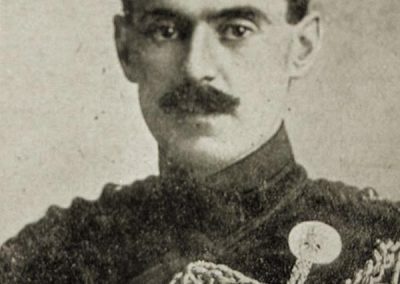 Almost immediately he was selected for service in the Boer War and fought as a section commander with the 4th Battalion, Rifle Brigade (Mounted Infantry) between 1900 and 1902 seeing much active service. 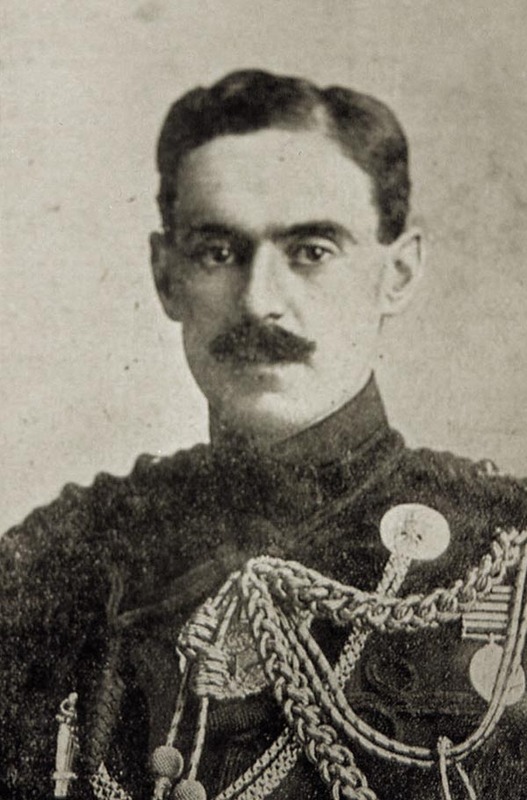 Captain Jenkinson was a very keen sportsman, fond of hunting, shooting and polo, but especially keen on shooting expeditions abroad, and always spent his leave on such expeditions and on trips to the Rockies, Caucasian Mountains, Asia Minor and South Africa. He had collected many good heads and trophies and a great number of birds. Natural History and Anthology were his special interests. He was a real lover of flowers and gardening. 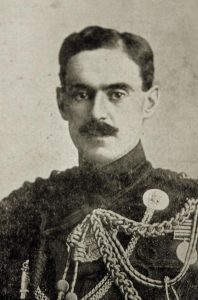 John went on to be the adjutant of the Mounted Infantry in Egypt from 1905 until 1908 and also found time to marry, marrying Joan Hill in 1907 and the following year, their first child, a daughter was born. His military career also developed as he was selected to attend Staff College, which he duly did in 1911. In 1912 he was posted as a general staff officer with Eastern Command and short time later, his second child, a son was born. 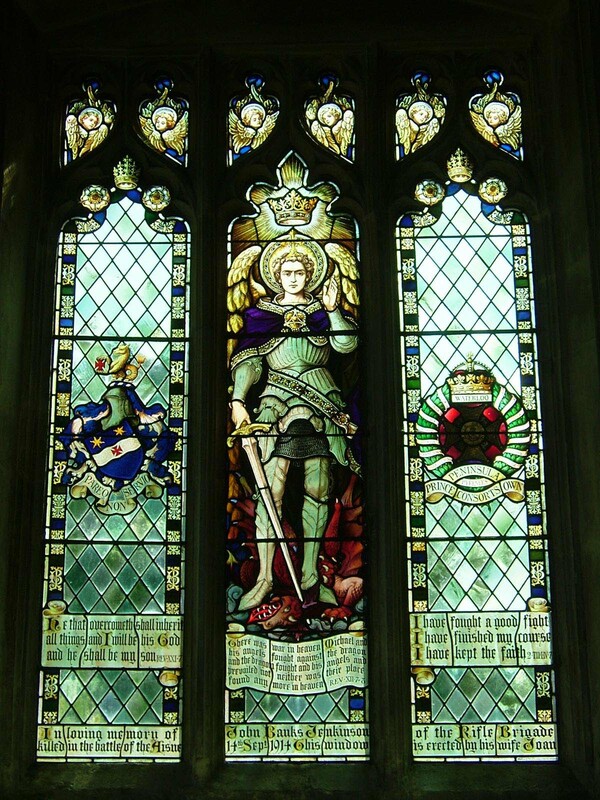 In 1913, he became the Brigade Major to the 3rd Infantry Brigade, 1st Division at Aldershot. When war broke out in 1914, the brigade was part of the British Expeditionary Force and mobilised for overseas service. Jenkinson arrived in France on 5th August, the day after Britain declared war in order to make preparations for the arrival of the brigade which began arriving on 12th August. At about 6am at Moulins we hear a good deal of firing going on and shells begin dropping about. We are then on the road moving north. The Queen’s have been redirected to the north-east some little time before and we are head of the Brigade. The 2nd Brigade is already engaged and we are sent to the high ground to the left to assist them. As we go we get some six shrapnels at us but mercifully are not touched. We reached the shelter of the high ground which rises quickly and steeply from the plain and then we advance over the crest and take up our position in a wood, ready to move out when required. Shrapnel and rifle fire fairly heavy. The first casualty is my mare who was shot in the head. Nothing very bad at present and she is able to go on carrying my stuff. Though I do not ride her. The General and Staff and CO and I watched the fight in the neighbouring valley in front. It is a high ridge opposite, i.e. west of us, that we have got to go for and nasty work it will be. Jenkinson, the Brigade Major, is killed, poor fellow, and soon afterwards we begin to suffer in the wood, chiefly from ricochets. 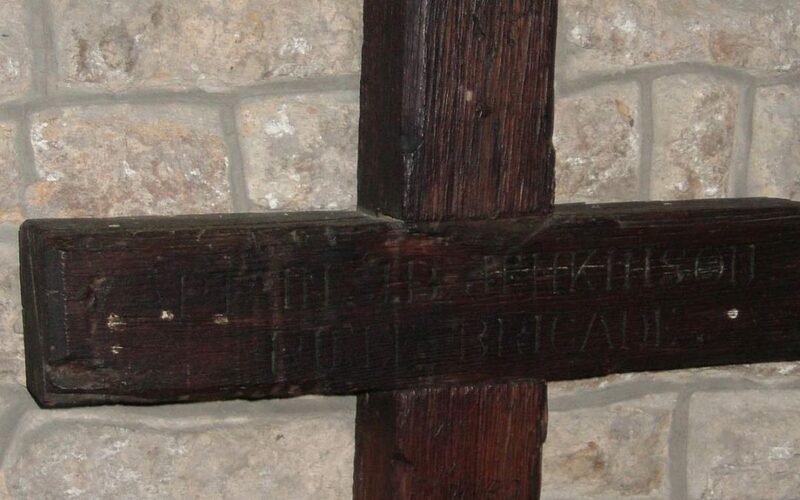 Captain John Jenkinson was buried in a battlefield grave and the site marked by a wooden cross. 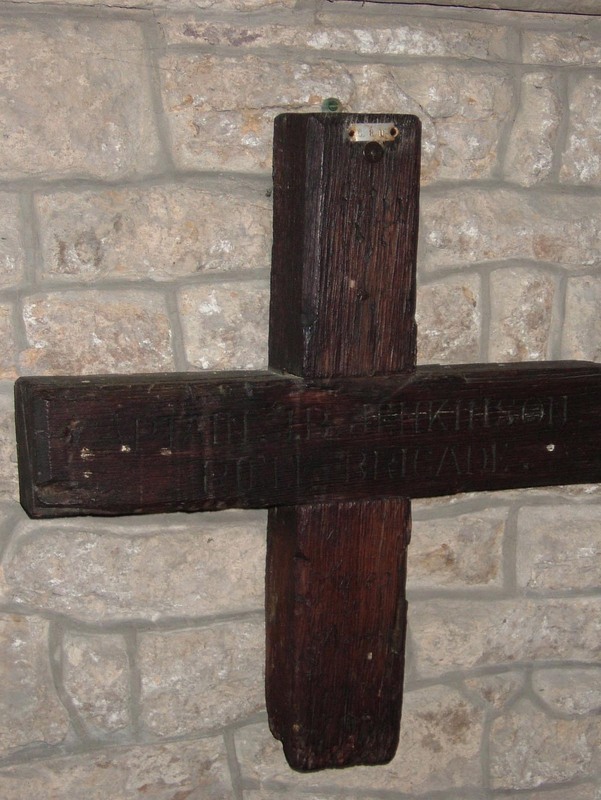 In 1920, his body was exhumed and moved to Vendresse British Military Cemetery (Grave I.C.17). 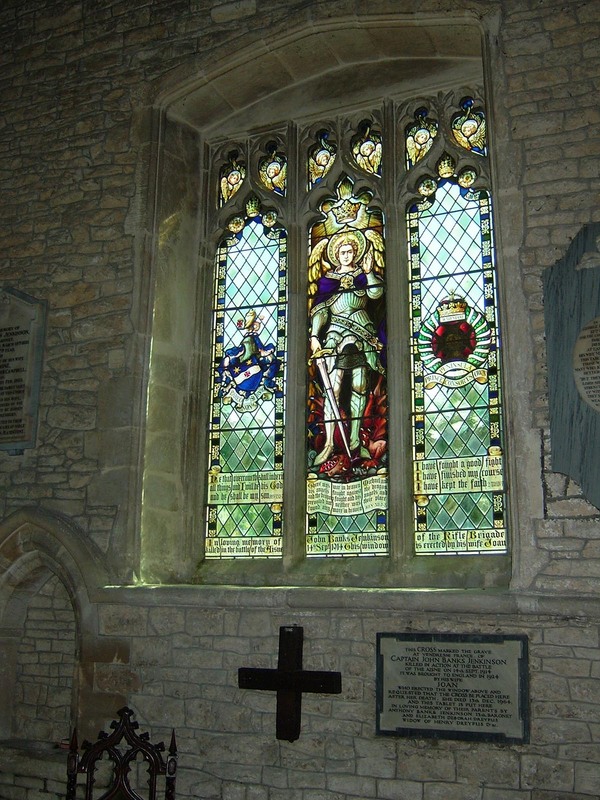 The original cross was returned to the family and was placed as a permanent memorial in Hawkesbury Church, beneath the memorial window which had been installed in 1916. His headstone bears the inscription ‘Blessed are the pure in heart, for they shall see God. Matt 5.8’. Initially, the family had considered placing his final words ‘Fight on’ on there as well but decided not to.